Charcoal has definite health benefits, and I think toothpaste with activated charcoal makes a lot of sense. 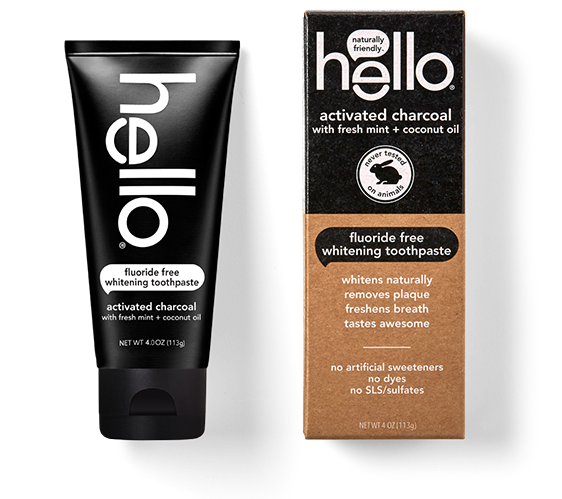 My wife bought a tube of this hello brand of black toothpaste a couple weeks ago and I've become a big fan of the product. "directions: apply to your fav bristles and brush like a boss. look in the mirror, dig your black teeth and take a selfie. fyi, black paste may be messy so please spit responsibly. smile often." Yes, there is a novelty aspect to this product, but I do think my teeth are brighter and my breath is fresher after using this toothpaste. "free from artificial sweeteners, artificial flavors, dyes, fluoride, sls/sulfates, microbeads, parabens, triclosan, dairy, and gluten. #brushhappy"
It appears that this product is also free from all capitalization. What's with that? Herrick - you may want to consider just Xylitol for "toothpaste" - a natural sugar-alcohol. Apparently it works against bad oral bacteria, and there are some foreign studies to prove it. See https://market-ticker.org/akcs-www?singlepost=3436745 for one user's experience. Don't let your dogs get to it, though; their systems will attempt (unsucessfully) to metabolize it.